It is apparent from the start that while elements which made Ah Dzam Poop Ek such a strong and profound manifestation are also present here, they are separated and general approach to songwriting is different. This album is comprised of shorter phrases and the compositions themselves are also shorter. That in itself isn’t condition precluding from creation of epic journeys, but Xibalba just seem to have different aims here. Back in the 90s Xibalba emerged as one of the best exponents of a way of channeling (ancient) national spirit into Black metal, as it was first shown by Norwegians. Xibalba correctly recognized it and used as a filter and framework to express analogous ideas (hinting by the way at something amazing), of course firmly set in a Mexican context. This time however, the band use more basic and universal raw black metal riffs and add to them Mesoamerican folkloristic leads. Eclectic in a true sense, it is also a case of greatly crafted cohesion between these two disparate elements. As for their function, constant leads and solos aren’t there to compliment or even to clash with the riffs, but to provide second, fairly autonomous voice. Riffs are meant to be rhythmic backbone and as such they are sometimes buried under leads and solos. It also robs them of their initiative and relegate that role it to the leads which often became more defining for the songs than whatever limited movement is set by the riffs, thus defying some important achievements of more developed metal. At the moment Xibalba is looking back to the basics of the genre and here basics doesn’t only mean, obviously, Bathory or Beherit, but also archetypes established by older and more popular forms of metal. It is a natural reaction to insipid emptiness of atmospheric black metal into which Norwegian sound was concluded due to some apparent lacking within individuals, who are now creating in that style. 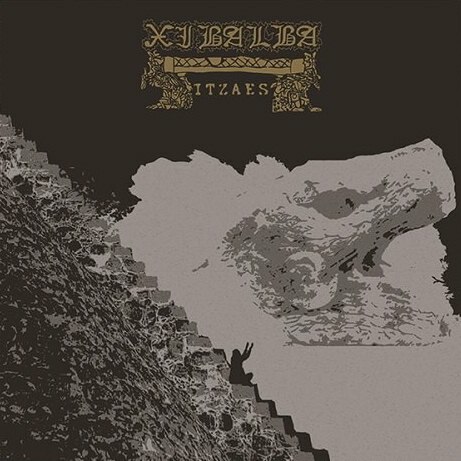 Underneath old and long-exploited forms there is some exhilarating ferocity to be found on Ah Tza Xibalba Itzaes and riffs and leads together are able to create some ecstatic moments. Yet simplicity and aggression utilized in order to regain some of the genre’s original energy comes at a price and despite having two such pronounced guitar voices, contributes to making the whole more one dimensional. All in all, no matter how skillfully implemented, it is Black metal AND some flavoring, instead of one voice shifting at will through various expressions contained within one organic flow of considerable depth. While the riffs may be adequately vicious at times, leads are emblematic to a point where they meet with simplest expectations and notions about culture Xibalba is trying to represent. What also they invoke is still too pervasive to be entirely dismissed and it is a proof of Xibalba’s mastery in conveying atmospheres they intend. On Ah Tza Xibalba Itzaes they are able to pull them of even through much simpler means than on their first full length, but there is no mystery here and very little of that fantastic, essentialist reconstruction drawn by the initiated directly from the esoteric soul of their culture. It is also especially in the lead department, though not exclusively, where phrases, despite being of completely different origin, are often invoking detrimental associations with rock music, which equals total capitulation by reverting to the mean. Among other problems is that the album is very short, with 1/3 of its material already presented on earlier releases. While these older songs fit well, that may be due to the fact that Ah Tza Xibalba Itzaes simply isn’t on par with albums which have that monolithic quality, with the ending being especially disorganized here. Still, even with redundant intro/outro and ritualistic segments which are really meaningless this time, the album feels very, very brief. Provided instrumental track isn’t even a shadow of Carchah with its pristine beauty or Bolontiku Vahom with its haunting depths. As a whole, in – let’s call it – artistic aspect, it leaves impressions similar to Burzum’s Belus: it is raw but mild (modern “underground” production! ), spiritual but dumbed-down, pleasant but unsatisfactory. More than to a desire to rate it, this release give rise to question whether there is a sense in a working with older, “historic” styles. Theoretically retrogression can be beneficial by providing clear lessons in logic, symbolic representation of ideas and models of their interactions – after all that was also a part of what Norwegians did in the 90s. Some may even think that it can lead to rediscovery or eternal conservation of the original spirit and meanings. Approach presented on Ah Tza Xibalba Itzaes shows a partial answer. It is both legit and promising way to compose metal, but comes with a slew of shortcomings which it reintroduces to already more advanced formula that overcame them as a part of its remarkable development. I still think Ah Dzam Poop Ek was a lot better. New Xibalba is a snooze fest and they are pussies for letting some cholo bros make them change their name. Engram is a solid album if you remove that corny trad/doom riff from “Pagan Moon.” Now, what are bands like early Dissection that are actually good? Please no middle eastern sounding scales. You know, that really gay one every thrash band uses. It’s why bands like Sorhin are unlistenable. GBK is the only band I’ve heard to use those type of melodies effectively. “Engram” is a work of brilliance and that riff/song in particular rules. GBK is the only band I’ve heard to use those type of melodies effectively. Known experts on middle eastern culture! Who let Varg loose in Paris?